Rick VanMatre is one of the most exploratory saxophonists in the world of jazz and classical music and has presented solo recitals and jazz club performances in the US, Europe, Israel, Brazil, and Asia. He is widely recognized for bringing a unique, identifiable voice to a variety of genres. In addition to leading his own ensembles with original music, his collaborations have included commissions and premieres of unique crossover works featuring art installation, aleatoric computer music, organ, vocal ensemble, Indian music, drama, and multimedia presentations entitled "Earthkind-Humankind" showcasing poetry and dance. He has performed with such diverse ensembles as the Duke Ellington Orchestra led by Mercer Ellington, the Woody Herman Orchestra led by Frank Tiberi, Roland Vazquez's contemporary Latin groups, and artists like John McNeil, Tim Hagans, and Gene Bertoncini. Recordings as featured jazz soloist include the PsychoAcoustic Orchestra, the Kim Pensyl Ensemble, the Cincinnati Pops Orchestra, Manhattan Transfer and John Pizzarelli. 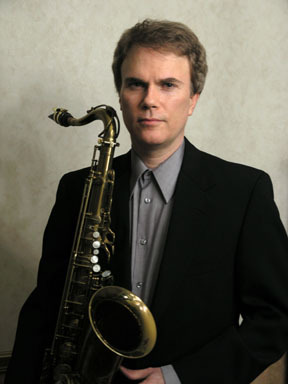 As a classical saxophonist, he has recorded interactive drama/music videos with composer/bassist Frank Proto, has appeared with the Cincinnati Symphony Orchestra, Rochester Philharmonic, concert:nova, and James Conlon's Linton Series, and has been a concerto soloist with the New York Repertory Orchestra, Sichuan Symphony Orchestra (China), Sheboygan Symphony Orchestra, Middletown Symphony, and Illinois Philharmonic. In reviewing the Chicago premiere of John Williams' Escapades for Alto Saxophone and Orchestra, the Chicago Star wrote that "VanMatre's art is without comparison; his technique exact, yet smooth, his expression poignant and personal." He is also active as a conductor and has directed programs on American Jazz Radio Festival, NPR, and for artists like Kenny Garrett, Slide Hampton, Joe Henderson, Ahmad Jamal, David Liebman, Jim McNeely, Joshua Redman, Kenny Werner, and Kenny Wheeler. In the field of broadcasting, he served as the on-air host and interviewer for the nationally syndicated radio series "Jazz - Live From the Hyatt" featuring artists like Joe Lovano and John Clayton. Mr. VanMatre is Adjunct Professor of Saxophone and Professor Emeritus of Jazz Studies at the University of Cincinnati College-Conservatory of Music. Formerly as the conservatory's Director of Jazz Studies, he was responsible for expanding the BM in Jazz, creating the MM in Jazz Studies and the DMA in Saxophone, and establishing the Jazz Recording Studio. He also headed the CCM Visiting Artist Series, one of the most extensive in the nation, including over 150 important jazz performers and composers such as Wynton Marsalis, Christian McBride, Maria Schneider, George Duke, and Eddie Daniels. As conductor of the CCM Jazz Ensemble, he produced five CD recordings for Sea Breeze Records. Serenade in Blue received a first round Grammy nomination and was described by Cadence magazine as a "necessary part of any big-band enthusiast's library" and Jazz News praised Carnival of Life as being "performed with conspicuous elegance and precision." He has presented performances and lectures for the International Association for Jazz Education, Music Educators National Conference, North American Saxophone Alliance, World Saxophone Congress, Jamey Aebersold Summer Jazz Clinics, International Summer Jazz Academy in Warsaw, Poland, and for universities and conferences in Europe, China, Thailand, and Brazil. He has written for Saxophone Journal, has served as Executive Board Member and Jazz Coordinator for NASA, was President of the Ohio Unit of the National Association of Jazz Educators, and is on the Editorial Advisory Board for the Saxophone Symposium. He has been named "Best Jazz Musician" by Cincinnati Magazine, a "reed titan" by Midwest Jazz magazine, a "superb instrumentalist" by the Cincinnati Enquirer, Ohio Jazz Educator of the Year by NAJE, and the "Ernest N. Glover Outstanding Teacher" by CCM students. His undergraduate studies were at the College-Conservatory of Music and Berklee College of Music, and he received his MM (Jazz Studies and Contemporary Media) from the Eastman School of Music. Many of his former students are active performers throughout the nation and others hold teaching positions at universities. Mr. VanMatre is an endorsing artist for Selmer Saxophones.